The promised rant against UPS (but not the FDA & Intervet/Schering Plough…yet) | Will My Dog Hate Me? Last week I deferred my desire to rant against various bureaucracies — both governmental and industrial; I’m an equal opportunity ranter — that were keeping Frankie and his diabetes drugs apart in order to provide some background, which I did here. Damn. I just found out that Vetsulin/Caninsulin is out of stock in Canada — where I’d been ordering it since emergency supplies in the U.S. were discontinued. I’m devastated at the thought of getting Frankie regulated on another diabetes medication, especially since my vet wasn’t very encouraging about the success he’s had with switching other dogs over. Karen of DoggieStylish.com suggested that some Canadian pharmacies that don’t ship to the US have might have supplies — and was generous enough to offer to mail them to me. Sure enough, I was able to order three bottles from the pharmacy she referred me to without a problem. This was on a Thursday. Karen picked up the Caninsulin two days later, on Saturday, and said she would mail it on Monday. I was leaving town the following Thursday, so we opted for two-day mail for $80 — as opposed to overnight for $130 — so that the Caninsulin would arrive on Wednesday, a day before I was to leave town. If the shipping seems crazy expensive it was worth it for me to have the perishable insulin arrive in two days rather than the five to 10 that the Canadian pharmacies that ship to the U.S. cite. And the Canadian pharmacy that Karen recommended charged HALF of what I was charged in the U.S. and at the other Canadian pharmacy ($27 vs $54 or $60 per bottle). So I ended up spending about the same amount of money for three bottles — less if you add the $15 the other pharmacy charged for the slow boat shipping. At this point I wasn’t concerned about replenishing my supply of Caninsulin; I still had more than a month’s worth. I was just worried about getting a medication that wouldn’t work because it had been subjected to heat and excessive jostling. On Tuesday, I began tracking the package on line. I’ve done this before and kind of like watching the progress of my purchases as they wend their way to me. First, the Caninsulin wouldn’t clear U.S. customs. Then the package was passed along to the FDA in Louisville, KY, where, in spite of being clearly marked as fragile and perishable, it sat and sat. I began to hate Louisville — which, pre-mailing, I considered a fine city with excellent bourbon — as the place where the package was going to live permanently. It was still in Louisville Thursday morning, when I had to leave for Scottsdale. But I wasn’t just tracking the package. I was calling UPS regularly to find out what the options were once it became clear that it might not be delivered while I was still in Tucson. Perhaps I could change the delivery address to that of a friend who would be home? Maybe it could be held at the UPS office in Tucson until I could retrieve it on my return, on Friday afternoon? What I didn’t want was for the drug to be driven around in a truck that is not temperature controlled all day when it could not be delivered. One person told me that they had to “attempt” delivery once to the designated address before any changes — including an instruction that the package could be held at the UPS facility — could be made. I asked to speak to a supervisor to discuss why this was the case. It was bad enough that the package wasn’t going to be delivered in the designated two days. I understood that UPS had no control over customs or the FDA (which actually require two much longer and separate rants). But why, for $80, could I not get the delivery — or nondelivery — that I requested? The supervisor I got was extremely nice. She said that, in fact, supervisors could authorize changes in delivery specification, but not until the package was released for delivery. She suggested I keep tracking on line and then call in again. Just so you know, for the most part I was very polite. I understand that people who answer the phones are not the ones who create the policy. But the notion that there was a stealth supervisor policy that some supervisors know about and some don’t was making my head explode. I did raise my voice a little at the second supervisor. It makes no sense not to be able to change the mode/place of delivery when the timely schedule of delivery you paid for is no longer in effect. Who is being served by that policy? Certainly not the customer. I checked online for the package one time on Thursday afternoon before I left for the book signing. It was still in Louisville. I didn’t want to ruin an event that I was nervous and excited about so I finally decided to let go and stop thinking about it. I managed so successfully that I went out for breakfast with friends the next morning and didn’t check online again until I was almost ready to drive back to Tucson. It was at 11:30am on Friday. You can imagine how shocked I was to read on the tracking statement that the package had been left outside, on my front porch, two hours earlier! It was an aberrant 85 degrees in Scottsdale and slated to go up to 95, which meant it was probably only a little cooler in Tucson. You call dropping a package off without requiring a signature for verification “attempted delivery”? After I’ve called at least 10 times to explain the situation, that I am not going to be home and do not want the package being subjected to physical conditions that could further endanger it? WTF?? In a panic, I started calling friends who live close to my house and who might be able to pick up the package quickly. One answered, but was out of town; two didn’t answer at all. I was about to begin throwing my net out to friends who lived farther from my house when Gabe, who not only lives close to me but has my key, phoned me back and told me not to worry, he would get the package inside and refrigerate the contents. I got home, looked inside at one of the bottles, and the solution looked okay; according to what I’ve read, if the insulin is ruined, it looks clumpy. Gabe told me that the package had been in the shade. And I saw that Karen had packed it very well. Still, I had to wonder about the next time, since there’s clearly no guarantee of two-day — or sensible — delivery. And here’s where things get even stranger. As I’ve explained, I was fixated on getting Vetsulin/Caninsulin because it was the product that Frankie responded to most successfully when he was first diagnosed with diabetes. Even though there were problems with the formulation, I was reluctant to switch over because he continues to respond well to this insulin and his blood sugar continues to be under control. But as I was preparing to write this post, I went on line to research the latest data on switchovers, thinking that, even if the drug is not discontinued worldwide, there’s a limit to how much stress I can take — stress that I no doubt pass along to Frankie, who saw me hunched over the phone, pacing around the hotel room, and otherwise being upset. That’s when I found Dr. Carol’s Naturally Healthy Pet Blog’s post on the original Vetsulin recall. 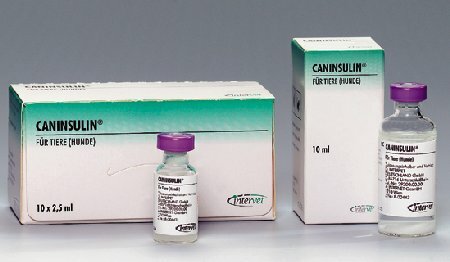 Vetsulin, the “special” insulin, labeled for pets… is actually Porcine Zinc Insulin, which is referred to as PZI. PZI is insulin derived from pigs, and in the past was used for people that are diabetics. Human diabetics use various types of insulin, for example NPH insulin, available at most pharmacies for less than $20.00 dollars a bottle. PZI is no longer commercially available because today modern technology develops human insulin from DNA, rather than pigs. Since the PZI or pig based insulin is considered to be inferior to DNA based insulin, people don’t use it and Intervet/Schering Plough apparently grabbed the rights and labeled it for dogs and cats. Now, I’m not taking this article as gospel although it upset me mightily when I first read it. Vetsulin had been billed as being effective because it was more similar to canine physiology than human insulin — which made sense. Or did it? Suddenly, I started wondering if I’d been duped by a drug company into believing that an inferior product that been repackaged for pets was superior. It wouldn’t be the first time. I said I’m not taking this article as gospel because there are many dubious things about it. Among other things, it suggests that owners: “Get a prescription from your vet for NPH insulin,” and then “Verify the correct dosage of NPH insulin with your vet.” As easy as that? I don’t think so. But it’s food for thought — and research, which I’ll share when I get more information. Totally maddening! These sorts of things drive me nuts. Feeling screwed over and out-of-control. I hate that! Dr. Carol’s post is intriguing. I’m curious to learn what you find out. I’m glad Frankie has enough insulin for now. Yes, it’s the feeling of being out of control that’s the most frustrating, I think. It seems like we spend a lot of time spinning our wheels… Maybe that’s part of the appeal of blogging. We can (usually) control that — no editors, no one to say when to publish and what to say. I’d be fuming, ranting, and totally pissed off. In fact, I am just reading about this! glad the insulin wasn’t ruined and next time, it might be easier just to visit us up here! I’ll have the coffee on! I use UPS ALL THE TIME and when you need something from them, it’s probably better to bang your head against the wall than get them to acutally do something. The other large companies like FED-EX or DHL are no better at getting stuff done in a timely manner, either. I’m just glad that the insulin arrived safe despite the fact that the package was dumped off with out somebody sigining for it :O Despite all the hassles that you had, I’m glad to do it again for you. I’m glad too, Karen, and can’t imagine how annoyed you must be having to deal with these companies on a regular basis. In spite of everything continue to be thankful that Canadian insulin is still an option — and of course extremely grateful that you’re willing to add me (and Frankie) to your long to do list! 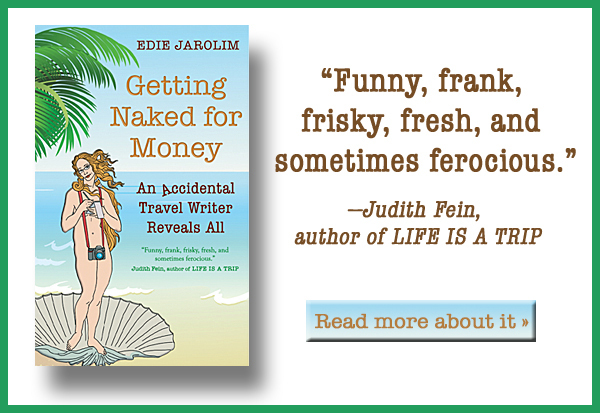 My God Edie! That’s absolutely horrible! I can’t imagine that UPS hasn’t had to deliver insulin before. Surely they have a policy on how they deal with such a thing. I mean honestly. Left it outside the front door? In Arizona of all places? Good lord! I don’t blame you for being upset. I read your post when Karen offered to get you the insulin, but now that it’s discontinued and you’ve got conflicting information, what are you supposed to do? I am so sorry. I cannot imagine how frightened and frustrated you must be. Thanks, Mel. It’s hard to believe that shipping companies wouldn’t be a bit more savvy about this kind of thing but noooo…. Still, with a four months’ supply of insulin now safely tucked away in the fridge I can once again defer any decisions about trying to switch over to another insulin while I do more research. What an ordeal. Hope the insulin is alright. Is there no way to have it checked somehow? If not, maybe you should start using the new package. You’ll still have some of the old supply as a fallback when it might go wrong. There’s no way to tell except visually, according to the original Canadian pharmacy. The crazy thing about this story is that the insulin described here probably spent less time en route to me than the insulin I’m using now — and might have sat somewhere in the hot sun for all I know. I thought about trying the new bottles, but the insulin solution is always slightly different at different stages of bottle use so it would be difficult to judge if any differences in blood sugar are as a result of a problem with the insulin — or because I started him on a new bottle. As operations manager, I spent decades dealing with UPS, FedX, DSL and USPS…they talk a good game but don’t play so well. Actually, since we shipped around the world, most of the times it was the customs in other countries that would foul things up. Once in a great while it was some small something in the paperwork we submitted. However, I was recently on the receiving end of a delivery mess up. I paid to overnight an expensive gift and when it showed “delivered” and I couldn’t find it, I called. First they told me that it was because I lived in such a “rural area”. When I pointed out that it showed delivered, they said there it was a “bad address” on the label. All 3 major delivery services deliver here all the time without incident. When I located the package it had our correct address on the label. Who decided that was not the right address? Here is the mystery, it was delivered about 20 mins away on another road where we own a vacant piece of land. It was left on the porch of the house next to our land. The only reason we located it is that the kids saw it when coming home and mentioned to their mother. I guess I should be thankful they didn’t leave it under a tree on the empty land with the underbrush and the snakes. I hate you are going through this. I wish there was something I could do for you. Frankie’s such a doll and thought of someone screwing around with his health just makes my blood boil! I have to say UPS has never impressed us. Years ago my husband tried to order from a glass company for his work. He needed some specially sized squares and levels. We were assured that it would travel safely and we paid extra. Needless to say it all arrived damaged. You can’t use a square or a level once it’s bent. And don’t you love when the supervisors say different things? I especially love how when that happens they proceed to imply I am a liar. My granddad was a reporter and used to have a little black mic attached to his phone with a cord leading to one of those mini tape recorders. It was just stuck there on the ear part. Sometimes I wish I had his set up so I could record these people when they tell me stuff. Jenni, you’re so sweet to get mad on my/our behalf. You probably could get a setup like your granddad had, no problem, but having things on record would probably just make you crazier when the next person told you that the person you recorded misspoke…. Sorry you had such a bad experience. As a supervisor, not being able to put a hold or change of address on an en-route package drives me batty as well. (I still do it for customers, but I never EVER guarantee it because there is no way I can be absolutely sure it will happen when it’s done by hand written notes being passed around in what is essentially a big warehouse) I understand the reasons for the company not doing it now, but I do think there is change on the horizon as our system has been changing drastically the last couple years. Unfortunately, a lot of the technology moves so fast that employees who don’t use it daily can’t possibly keep up with it (the single most frustration part of my job, given that I am one of the people who DOES use the technology every day). Yes, mistakes get made, everybody is human, but I have no doubt that the vast majority of drivers are very good people who work very hard to do right by their customers. There really is no way for a driver to know what is inside a package, and unless the shipper requires a signature for delivery the package will be released without one. Really, when it comes to that, we can’t win – one minute I will have a customer screaming at me because they want the driver to just leave the package on the porch without a signature (which we can’t do if the shipper requires one) and the next minute a customer will be angry we left the package on the porch without one. It costs more money to have a driver make multiple attempts if needed, and that’s why there is a charge for requiring a signature at a residence. Also, ALWAYS keep in mind that nothing at UPS (or any other non-specialized shipping company, to my knowledge) is ever temperature controlled. I find a LOT of people (and companies) misunderstand this – during winter in Wisconsin we have juice companies that will ship cases upon cases of juice in glass bottles when it’s 10 below – talk about a giant mess when the bottles start exploding. It’s unfortunate the supervisor you spoke with first wasn’t able to finish the job (especially if you were able to provide a tracking number – if not, even my hands are usually tied). Hopefully things will go smoothly from here on out. Ugh…what a mess..what a headache! Poor you for all the hyper-vigilance/overflowing adrenaline. Poor Frankie for having to watch and wonder! Would be nice if the FDA concentrated efforts on all the unexamined cargo containers of food and other toxic goods from China rather than barking up the dog meds tree…oh, nevermind. I keep asking too much. I have to order some meds from Canada…sigh. I don’t really understand your vet’s hesitancy to try NPH. We see it work beautifully in dogs all the time. Not all dogs. But then Vetsulin didn’t work for all dogs either. A lot of the hype over Vetsulin is just that – hype – much of it coming from Vetsulin sales reps. We have had a couple of dozen dogs at the forum go through the transition in the last year. Unfortunately the guidelines that were given were terrible. But if the transition was done right – a reduction of 20-25% in the Vetsulin dose and then work up from there to the right dose of NPH – it went smoothly for every dog I can think of and many folks preferred NPH to Vetsulin once their dog was on it. It has worried me that some vets – not saying yours was one – didn’t switch dogs over and, as a result, put a lot of responsibility on the emergency program. Had more vets switched dogs to another insulin, only the dogs who truly truly must have Vetsulin because they are allergic to NPH would be trying to get hold of a supply in Canada. Natalie, thanks very much for your feedback. I’ve been meaning to ask you how members of your forum were doing with the switch over. The reading I’ve done for this past blog post led me to the same conclusion about the Vetsulin hype. And I’ve read that well regulated dogs in particular have less problem with the switch over, so I shouldn’t really base any decision on Frankie’s original glucose curves, since he’s been regulated for several years now. I now have three bottles of Caninsulin, and plan to try the transition when I have one left.